COMPASSIONATE CLIMATE ACTION: 142 Days to Copenhagen - I Have an Idea for All the Deniers! 142 Days to Copenhagen - I Have an Idea for All the Deniers! Climate change deniers give me the creeps, especially when I meet them in person. My most recent up close encounter was with a purportedly intelligent and "spiritual" fellow who confided that we don't have to worry about climate change, because we'll all be able to teleport to another planet. Not in my lifetime, Dude! Not enough spiritual people on this planet to make it happen, I'm afraid. So, calling all deniers. I have an idea for you. 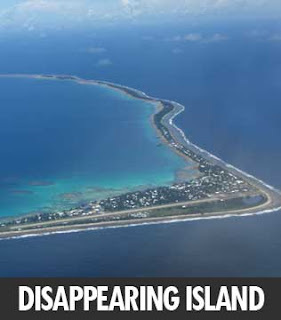 Why don't you take a nice long vacation in the exotic Pacific island nation of Kiribati ... perhaps on lovely Tebua Tarawa Island, or Abanuea Island. Oh, sorry. Those islands have disappeared! How about the village of Lateu in Vanuatu? Nope, gone. How about Tuvalu? Sorry, it's disappearing, too. How about the Cook Islands, Micronesia, Fiji, Papua New Guinea, the Marshall Islands ... nope, sorry, all going the same way. How about Zanzibar then? Or a nice trip to the Arctic? Disappearing. I invite you to visit these beautiful places (the ones not yet entirely lost to the sea) and tell the people whose homelands are disappearing that global warming is a hoax perpetrated by the government so that they can tax us to death. And be sure to look them right in the eyes when you're telling them that.